Hey Everyone! I'm back for Work It Wednesday with Laura @ A Little Bit of Lacquer. I apologize for being absent the past few weeks, things got a little crazy around here! From sickness to life stresses, we've been through the ringer over here. Anyway, I'm back in full swing and ready to smother my blog with love! I also wanted to share a recent little project I took on. So, you know the Christian Louboutin Altipump? 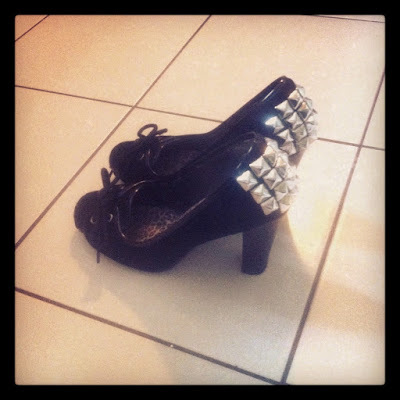 Well, I've been obsessing over them for months and since I absolutely cannot afford Louboutins, I ventured out on a journey to make myself a pair of spiked pumps. I did my own spin on the Altipump. 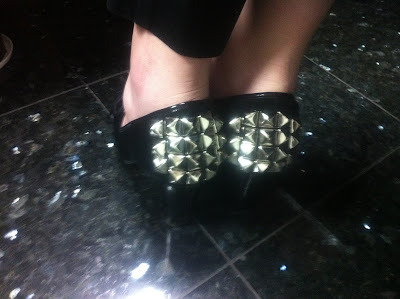 I ordered a beginners studding kit from Studs & Spikes and took an old pair of black pumps from Target and started stabbing holes into my shoes blindly. WARNING! Don't do this. It took me awhile to fix my crooked studs. Trust me, you don't want crooked studs! After a bit of trial and error, I came out with these bad boys! If you have any other questions, let me know! I used the tools included in the beginners studding kit and a pair of needle nose pliers. I'm happy to be back to my little blog. I promise I won't leave you again (for awhile, at least :)!